I love the classic card games like Euchre, Hearts and Spades, but after playing them for years they got a little stale. 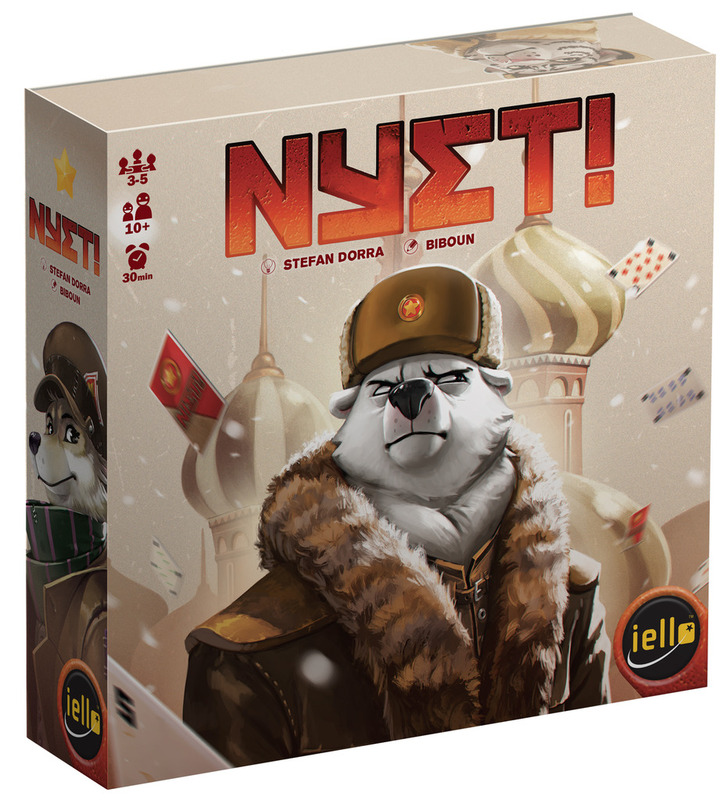 In comes Nyet!, attempting to shake things up a bit and take a normal trick-taking game and make it more exciting. Does Nyet! do enough to re-energize the trick-taking genre? Like most trick-taking games, the goal of Nyet! is to take the most tricks (hands) by playing the highest cards, thereby, gaining the most points. However, the similarities are few and far between after that. To start the game, and each round after that, each player places multiple tokens, one at a time, onto a common board signifying an option they do not want to become a rule for that round. There are several rules that they players can alter each round of the game including; starting player, cards to discard/pass, trump color, super trump color and points per trick. When there is only one option left for each rule then the newly chosen first player, picks their team. If a game with an odd-number of players, the first player can choose to have more, or fewer players on their team. If they choose to have fewer players than the other team then each trick they win is worth double points. After the teams have been picked and the cards have been discarded/traded then the round begins. No matter what rules have been selected play progresses like most other trick-taking games. The first player plays a card and everyone must follow suit unless they do not have the suit and then they can trump the trick by playing any card of the trump color (if any). The highest number wins. If a trump has been played then the highest trump wins. The differences are that there may not be a trump color and there are super trumps. Super trumps are the 1s of the chosen super trump color and win over any other trump card, but be careful because there are three 1s of each color and the last 1 played, wins. After every card has been played, the round ends and the players, individually, get points based on how many tricks their team won, multiplied by the number of points per trick chosen at the beginning of the round. In addition to those points they also get an extra trick for any 1 they won played by the other team. Since teams can change every round, each player gets the points their team earned. Play continues for a specific number of rounds, based on the number of players. Growing up with Euchre being a staple in my family and among my friends, I have always been a fan of trick-taking games. They combine tactics, strategy and luck into a beautiful package. Most of the games are somewhat easy to learn, but hard to master. You can play games such as Hearts and Euchre for years and still get beat by someone who really knows the game. Nyet! is no different in that it doesn’t have a huge barrier to entry, but to truly know the game, to truly be great, you are going to need to play it a lot. There are many things I love about Nyet!, but none more so than the tricky selection of partner(s) when you are the first player. You win Nyet! by having the most points at the end of the game, but your partner(s), for any given hand get the same amount of points as you, so you can’t always choose the best player to be your partner. When you are the first player you have to think about everyone else’s scores, who vetoed certain rules, who got excited when certain rules were chosen, etc. Also, playing with an odd number you can choose if you want the smaller or larger team. So many good choices! In my plays of the game, I have almost wanted to declare victory when my choices for trump and super-trump were selected. It was like I won the lottery! Though, in reality, the tricky part of the game is yet to come. Actually playing the hands is the other half and it is filled with just as many good choices. Do I try to sneak this 1 into the hand that my partner is currently winning? Does someone else have the other super-trump or am I safe playing my super-trump? The twist of adding three 1s to each color really makes for more interesting choices and I salute the designer in that decision. Oh, and I should probably mention. While, there definitely does not need to be any art at all for this game, the art is amazing. Biboun is incredibly talented and I love the anthropomorphized Russian animals, because…why not? Nyet! is not a terribly difficult game to understand, though having experience playing other trick-taking games would definitely help. After playing a couple of rounds most players will understand how the games plays, but it will take many plays to master. I just came across your site and wanted to let you know how much I love it! The graphics, the layout and the content are truly fabulous.